Your brain has an astonishing ability to adapt and reshape itself (i.e. neuroplasticity), when it is given right stimulation. Scientists have discovered that healthy habits (such as regular physical activity, healthy diet, daily de-stress and adequate sleep) nurture your brain and help in preserving and improving your memory and cognitive functions. It directly increases heart rate and oxygen flow to your brain. It increases growth factors in the brain, which stimulates brain’s neuroplasticity to grow new neuronal connections (i.e. angiogenesis, neurogenesis, synaptogenesis) between cells in different cerebral structures involved in cognition. It helps in releasing brain-derived neurotrophic factor (BDNF) i.e. chemicals that nourish brain cells, regulate inflammation, improve transmission of signals within cells and regulate the functions of the synapses. Exercise also exerts a positive effect on cognitive function by improving your mood and sleep; and reducing stress and anxiety, the major contributor to cognitive impairment. Research suggests that the antidepressant effect of exercise is also associated with more cell growth in hippocampus, an area of the brain responsible for learning and memory. Usually, mental efficiency and memory decline with age and the risk of developing neurodegenerative diseases like Alzheimer’s disease and dementia increases. Regular exercise besides helping aging adults in improving their memory and brain health can also prevent neurodegenerative diseases. In a study, people who were active in their middle years and even those who began exercising after hitting mid-life had lower risk of developing dementia and Alzheimer’s disease in their old age than those who do not exercise. In another study, older people who vigorously exercise had cognitive test scores equivalent to 10 years younger people. Learn easy ways to improve your circulation. Regular moderate to vigorous exercises can help you reap these benefits. Aerobic exercise activates and maintains the sensorimotor network while coordination exercise activates and maintains the visual-spatial network. So, a combination of physical and mental exercise will be the best brain health workouts to improve overall cognitive health. Natural exercises such as regular dancing integrates different parts of the brain such as coordination, rhythm, and strategy and offers the maximum benefit to preserve and even improve physical and mental fitness in advanced age. If you are new in the world of exercising then start with walking outside in the natural surroundings. In a study, researchers found that when people spent time in nature, as opposed to an urban environment, their attention and memory improved. Then, slowly build an exercise routine, where you get at least 30 minutes of moderate exercise (brisk walking, jogging, swimming, stair climbing, tennis, squash, or dancing) three to four times a week. Complex Carbohydrates: Carbohydrates fuel your brain, but to concentrate and focus you need healthy long lasting energy. Low-glycemic index (GI) complex carbohydrates release glucose slowly into the bloodstream, which helps in keeping you mentally alert throughout the day. Opt for wholegrain cereals, brown rice, oatmeal, lentils, and beans. Avoid simple carbohydrates especially from processed foods (filled with fructose, sugar and refined grains), which break down very quickly. Colourful vegetables and fruits: Vegetables and fruits are powerhouses of vital nutrients (vitamins, minerals and phytonutrients), required for optimal brain function. Fill half of your plate with different coloured vegetables (especially cruciferous ones broccoli, cabbage and leafy greens such as kale, spinach, leeks, romaine lettuce, Swiss chard and arugula) and fruits (bananas, apricots, mangoes, cantaloupe, and watermelon). In a study, women who ate plenty of vegetables were found less likely to develop age-related memory problems. Antioxidant rich plant foods (cocoa, blueberries, blackberries, cherries, green tea, turmeric) have anti-inflammatory properties, which help in protecting your brain cells from free radical damage. Also, a flavonoid (resveratrol) found in grape juice, cranberry juice, fresh grapes, berries and peanuts boosts blood flow in the brain and reduces the risk of Alzheimer’s disease. So, consume more of these super foods to enhance memory, mental alertness and slow down brain aging. Healthy fats: Healthy fats especially omega 3 fatty acids are essential for good brain health. To improve memory and better cognition get your omega-3 fatty acids from walnuts, ground flaxseed, flaxseed oil, winter squash, kidney and pinto beans, spinach, broccoli, pumpkin seeds, soybeans, olive oil and fatty fish. In a study, women aged 60 and older, who ate more unsaturated fat (vegetable oils and fatty fish) and less saturated fat (red meat and full-fat dairy foods) had significantly less decline in memory than those who ate relatively little unsaturated fat. These foods can also help you improve your brain health. 3. Daily De-stress: Stressful and hectic lifestyle of these days take heavy toll on your brain, which makes it difficult to concentrate and remember things. In the long run, this chronic stress can destroy brain cells and damage the region of the brain involved in storing memories. Research shows that de-stressing and relaxation exercises like mindfulness, yoga and meditation can improve focus, concentration, creativity, learning and reasoning skills. This wonder drug has shown great benefits towards improving stress levels. 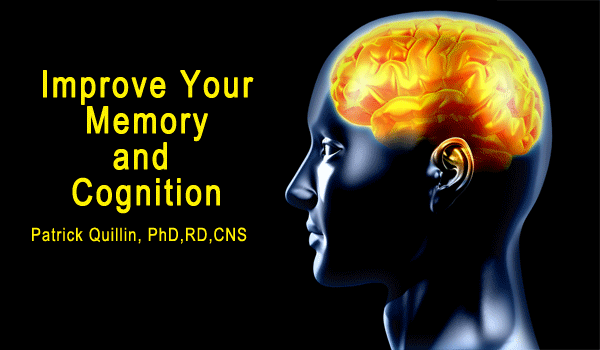 Encourage more connections between brain cells, which help in enhancing mental sharpness and memory. Reduce activity in the brain’s default mode network (DMN), which is active when mind wanders from thought to thought, creating distress. In a study, after practicing mindfulness techniques (breathing, listening to relaxing sounds, and counting exercises) just four times a week for 45 minutes, graduate students improved their memory and focus in just two weeks. Finally, your brain consolidates memories in your sleep. Even a little sleep deprivation can adversely affect your cognitive functions and lead to poorer attention, learning and creative thinking. So, take steps today to ensure an undisturbed sleep of minimum 7-8 hours for mental alertness and optimal functioning of your brain. ← Should I Juice or Puree?